Nate Stanley emerges, Wadley dazzles, the youngsters shine and Iowa overcomes a swooning defense to escape Ames with a win. We break it all down in this episode, with guest Matt Randazzo (@MattRandazzo), sports director at WQAD. Follow us on Twitter @12Saturdays and on Facebook. Not much giddy-up from these Cowboys, as the Hawkeye defense smothers Wyoming and their first round QB. On the other sideline, Iowa QB Nate Stanley finds his sea legs after feeling a bit Fant. 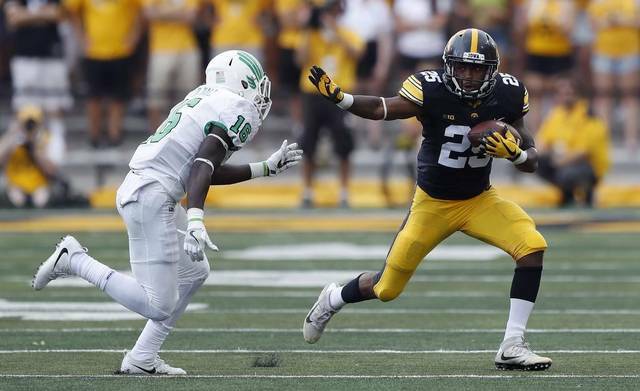 Marc Morehouse joins the crew to talk Iowa football and beer Yeehaw! We’re Back! Now with 50% more Derp! Did you ever feel that the 2016 season just didn’t live up to the hype? Was it the Outback bowl, or losses to NDSU and NW, or the fact that your favorite podcast was on hiatus? Well good news, Everyone! At least one of those problems is fixed, starting today. 12 Saturdays is rebooted and back online, and our friend Bill Delehant joins the inanity. Check out this week’s episode, where we discuss Iowa’s 2017 prospects with Scott Dochterman from LandOf10. Subscribe on iTunes, and now also on Stitcher! Iowa dives in to a Sea of Red, and emerges with its fourth Rivalry Trophy. Gotta catch ’em all! Our guest gives us the flavor of Lincoln. On to Indy! The superlative season continues, as the Hawks handle Purdue and take their unblemished record in to the final week. And our guest gives an outsider’s perspective on football, blizzards, tailgating and chicken wings. With Floyd by their side, the 2015 Hawkeyes sail boldly in to Uncharted Waters. Here be there Dragons? Nah, just Boilermakers. Tory conducts field research to assuage his anger at the lack of Iowa Love by the national sports media. Indiana made it interesting, but against the 2015 Hawks, the outcome was never really in doubt. Credit to CJ, the Defense, or…pickles? Our guest is a returning fan favorite who educates us on football, fatherhood, and Star Wars. We’re back, and just as “meh” as ever! Discussions of the NW and Maryland wins, the first CFB rankings of the season, and what it will take for Iowa to get to the Championship Game. Our guest is a transplanted Hawkeye and former roommate, and always presents an editing challenge to avoid an “MA” rating. Why won’t Leon turn the tortoise over?